Discover India in style on this privately chauffeured tour and enjoy outstanding savings / rewards as this journey is designed using special offers at the luxurious Oberoi Hotels & Resorts. Crafted for discerning first-time travelers to the Indian Subcontinent; this luxury India holiday begins amongst the landscaped gardens and pools of The Oberoi New Delhi – an award-winning luxury hotel which has been superbly re-designed to showcase a contemporary interpretation of Sir Edwin Lutyens' New Delhi architecture. During your 2 nights sojourn in Delhi discover the city’s Mughal as well as colonial heritage and enjoy a walking tour that takes you through the teeming alleyways and the old spice markets of Old Delhi. Next, proceed to Agra, where you will spend 2 nights at The Oberoi Amarvilas, an opulent hotel that enjoys an unrivalled location near the Taj. Here, watch the sun rise over the magnificent milk-white Taj Mahal; visit the imposing Agra Fort as well as the little-known Red Taj and in the evenings enjoy outstanding views of the Taj from the comforts of your private balcony, which is a serene place from which to capture the sense of love and loss that led to the creation of the Taj. Then, visit the abandoned Mughal city of Fatehpur Sikri, before embarking on a short train ride through rural India to Ranthambore – India’s premier tiger reserve, where you will spend 2 nights at The Oberoi Vanyavilas – a world-class jungle camp. At Ranthambore, accompanied by your naturalist set off on early morning and late afternoon private jeep safaris; follow the alarm calls of birds and langurs to track tiger in its natural habitat, then wrap up the day with a visit to the Spa or a dip in Vanyavilas’ temperature controlling swimming-pool. Conclude your Luxury India holiday with 3 nights at The Oberoi Rajvilas, a palatial retreat that is located just outside the ‘Pink City’ of Jaipur, where you will combine visits to the spectacular hill-top Amer Fort; the regal City Palace and a heritage walk meandering past old havelis and vibrant bazaars with a short elephant-back ride through the colourful Meena tribal villages. Day 5 Early morning and late afternoon wildlife safaris. Day 7 Morning tour of Amber Fort. Then, enjoy elephant safari through the colourful Meena tribal village. Day 9 Farewell to India. Drive to Agra via Sikandra. Afternoon tour of Agra, which includes visit to the imposing Agra Fort and a relaxed stroll through Mehtab Bagh that offers outstanding views as the sun sets over the Taj Mahal. Sunrise visit to Taj Mahal. 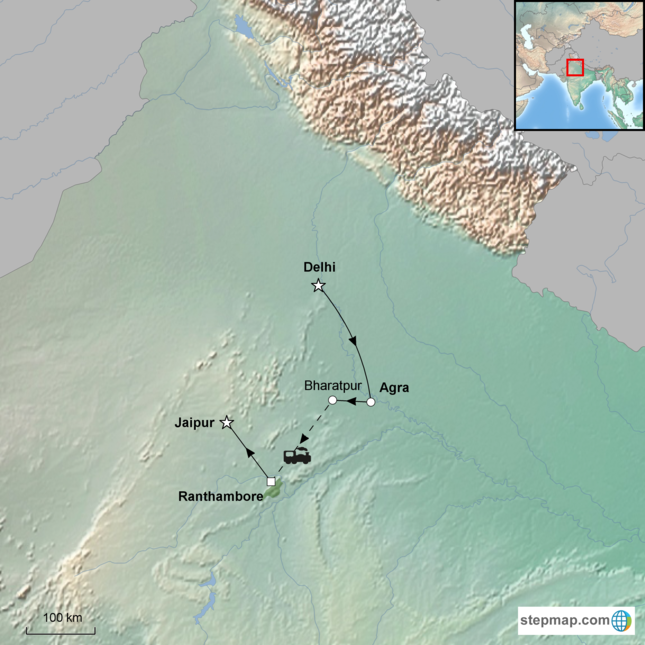 Then, visit Fatehpur Sikri, before taking the train to Sawai Madhopur - gateway to Ranthambore National Park. Early morning wildlife safari. Arrive Jaipur. Morning tour of Amber Fort. Then, enjoy elephant safari through the colourful Meena tribal village. Discover Delhi's colonial and Mughal heritage. Enjoy a stroll through Mehtab Bagh gardens, which offers outstanding view of the Taj at sunset. Set off on private jeep safaris to track tiger in its natural habitat. Experience an elephant back ride through the colourful Meena tribal villages. Explore the spectacular Amer Fort and the vibrant markets of Jaipur.